Allow Chocolate Kitchen to create a bespoke selection of truffles for you. Our truffles are handmade in small batches to retain their freshness and quality of flavour. We individually enrobe and decorate every chocolate to give a personalised finish to each different flavour. 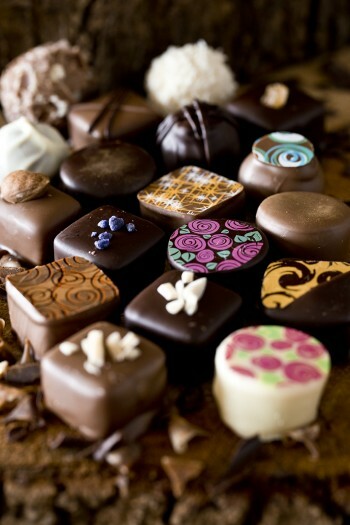 Additionally, our cholcolates are beautifully packaged to make a lovely gift or a decadent treat! Our chief Chocolatiere, Meghan, oversees every batch of chocolates to ensure the consistency of taste and quality. Her style of truffle making aims to match a delicious initial burst of flavour from the truffle filling with an excellent chocolate flavour to finish. For this reason we use various specially selected high quality chocolate couveture from all over the world, mixed with lovely cream, real butter and natural ingredients where possible, to make our chocolates and truffles. If you would like to you are able to make your own selection from our delicious hand made chocolates range, including truffles, caramels, pralines and seasonal specials. Alternatively choose the ‘Chocolate Kitchen’s choice’, and let us send you a selection of our family favourites. Our Selection contains: Gluten, Milk, Nuts (including hazelnuts, almonds and pecan nuts), and Soya. Produced in a kitchen which uses various types of nut.